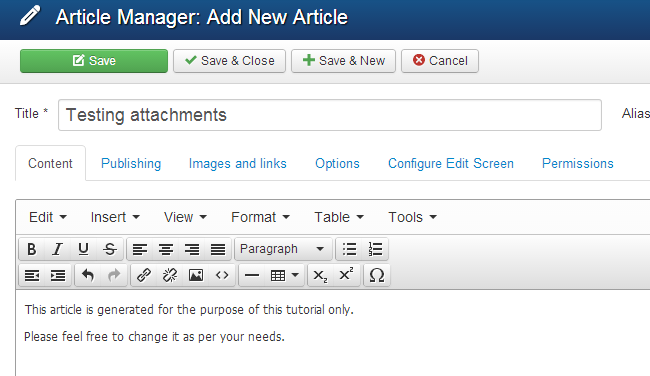 This extension will allow you to add attachments directly to your new articles in Joomla. They will be available for download on your website. You can download the extension from the official Joomla extensions section. You need to select the Directory & Documentation category and then Downloads. Then simply review for the Attachments extension from the list on the screen. The installation of the Attachments extension is standard. We do have an excellent tutorial on How to install and uninstall extensions in Joomla. The installation of the extension will automatically enable it on your website. Thus, you will be read to use it. To do so, you need to log into your website as administrator and navigate to the Content tab from the top menu and then Article Manager>Add New Article. Enter the article’s title and body. Scroll down below the body of your new article and you will notice the Add attachment button. Upload the attachment on your new article and click on the Save & Close button at the top of the screen to publish the new article on your website. Note that we have set it as featured so it will be visible via the homepage directly.